One of the common barriers to eating a healthy and sustainable diet on a low income is the physical access to places selling food. According to previous research, more deprived areas often have fewer grocery shops, and fresh fruits and vegetables tend to be more expensive than at supermarkets further afield. 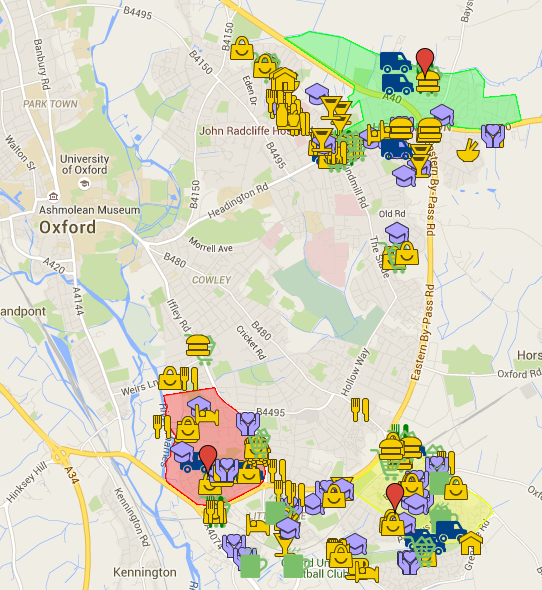 While Oxford is not known for being a “food desert” – an area where food retailers are absent or in short supply – the city houses several lower-income neighborhoods where food is a concern. 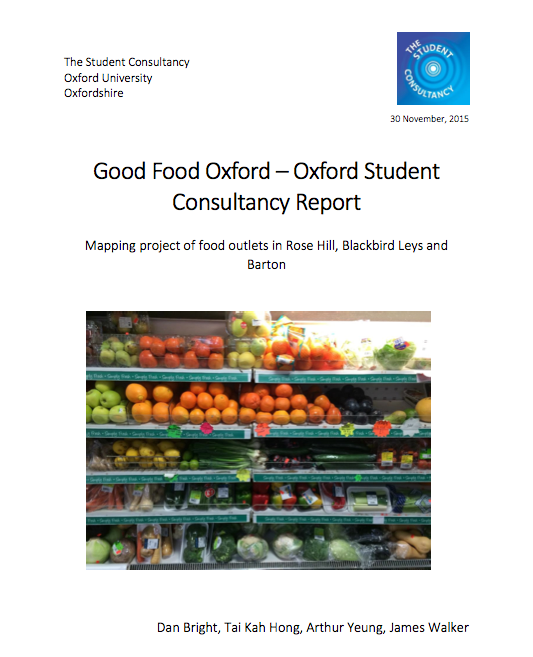 To get a better sense of the state of food retail in the focal areas of a GFO report on food poverty in Oxford regeneration neighborhoods – Barton, Blackbird Leys and Rosehill – the Oxford Student Consultancy investigated further. During seven weeks of Michaelmas term 2015, the students walked around these neighborhoods looking at type and price range of food outlets. Back at the desk, they mapped and categorised various shops – from grocers to take-aways to sit-down eateries – noting average travel distances from residences. The verdict? Barton and Rose Hill play host to a single corner shop each, necessitating venturing perhaps 1.5km to larger supermarket chains. While only one chippy and a community café provide cooked meals in Barton, a smattering of take-aways dot the fringe of Rose Hill. For both, the food bank drop off points are the cheapest and most accessible sources of fresh fruit and veg. Bananas served as a mark of the price differences, with a single banana ringing up 60% more in corner shops than in the larger retailers. Blackbird Leys differs substantially from the other two neighbourhoods in that there is a host of large food outlets at the Oxford Retail Park, and a new cut price supermarket on the edge of the Leys.